Most people will have an operation in their lifetime, but few of us have a clue what really happens once we are put to sleep. 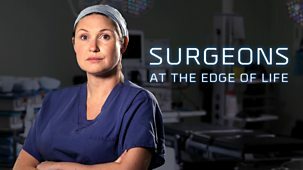 This series goes beyond the theatre doors of the surgical unit at the Queen Elizabeth Hospital Birmingham, where 700 operations are carried out every week, across 42 specialist theatres. 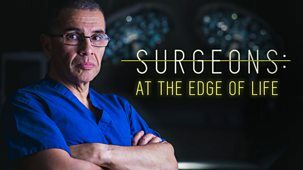 Whilst many operations are vital but routine, this series focuses on some of the country's top surgeons as they perform high-stakes surgery that simply wouldn't have been attempted a few years ago, pushing the boundaries of modern medicine to its very limits. 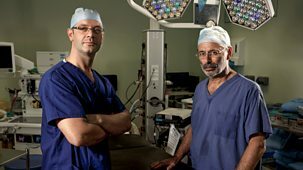 Unprecedented opportunities to save lives offer surgeons the chance to develop their astonishing skills - but also carry daunting risks and responsibilities. 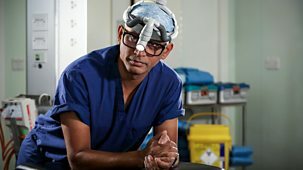 A dark sense of humour, a cool head and extraordinary levels of accomplishment are the tools of the trade.\n\nIn the first episode, specialist maxillofacial surgeons Tim Martin and Sat Parmar prepare for a marathon operation on 53-year-old Teresa. Four weeks ago, Teresa was diagnosed with a fast-growing cancerous tumour in her face and she will die within weeks unless it is removed. The procedure involves radical surgery to the entire right-hand side of her face, and means she will lose both her upper jaw and right eye. It is an enormous undertaking for Teresa, and for Tim and Sat, too.\n\nUsing 3D imaging, the team plan how to remove the tumour and, most importantly, how they will rebuild Teresa's face. Tim and Sat are all too aware that whilst removing the tumour will save her life, it will be devastating if she is left disfigured and unable to face the world. To give her the best possible outcome, they intend to fill the cavity left in Teresa's face with a section of bone and muscle removed from her hip, using a 3D-printed plastic guide that helps them cut out the correct shape bone.